Thank you all very much for this. Having great fans and having fun with them is truly a gift that keeps on giving. We are blessed. Thanks to Mike Vagnoni and all the people at Out On The Town for yet another nice article that they did on us in their Feb-March 2016 issue. Thanks to Mike Vagnoni and all the people at Out On The Town for another nice article that they did on us. (Read the article here). For all dates, see the 2019 Calendar. Keep checking back---Dates are coming in! Photos: Tony at Kris & Loretta's Wedding; Tony & Fire&Ice, circa 1988; The Expressions with Tony Marco; Fire&Ice lost Meetinghouse Road Party photos; Red Rose Inn Brandywine Room poster; and Fire&Ice/Junction 1973 Poster photo added to the Tony Marco Memorial Photos. Photos: Backstage at the Philly Welcome America 2014 July 4th Jam are in the Welcome America 2014 folder. Billy & Paj (and Kris & Loretta) were invited by ?estLove (whom we first met at age 5) to be backstage guests at the Philly 4th of July concert to renew old Lee Andrews & The Hearts acquaintances (Donn, Jaqui, and Karen & family) and to spend time with recent and new friends on the job. It was so good to see everybody and to see that they were all healthy, happy, and doing fine. The weather was fine and it was a great day of music and camaraderie. Thanks to everyone! We are truly blessed! We shot a lot of pictures, which you can view here. We at Komen send our heartfelt appreciation for the support and generosity of the donation. We Thank you sincerely for choosing Komen Philadelphia for your fundraiser and hope we can partner for next year’s Breast Cancer Awareness Month. That donation will help pay for free screening and mammograms and treatment for uninsured and underinsured women who I know are thankful to your Band as well. Through those screenings many lives have been saved and know that the 4-PLAY BAND has helped us to continue our mission in serving woman throughout the Tri-State area. 4-Play Band wants to at least double our contribution so, please, help us support a noble and necessary cause by either donating directly to the Susan G. Komen Foundation or by purchasing a Pink&Black 4-Play t-shirt from us (all of the profits go to the Susan G. Komen Foundation). Please note that 2018 dates are quickly filling up for us. Several clubs have asked us for regular rotation dates, which could affect the availability of 3-4 dates per month from now until the end of the year. 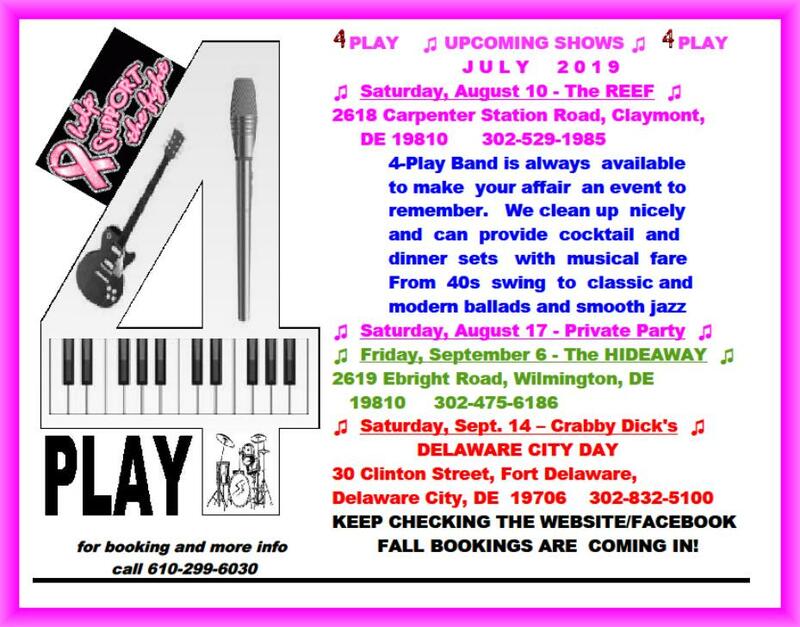 If you are considering having the 4-Play Band as part of your affair, please don't hesitate to contact us---and the sooner, the better!